Project obstacles and solutions: The Talawanda School Corporation in Oxford, Ohio was constructing a new high school building that was designed to achieve LEED Silver Certification. The two story above grade building encompassed 180,000 square feet and was built using insulated concrete forms (ICF). Ferguson Construction was the general contractor for the building. They chose to use Nudura ICF forms. ICF constructed walls achieve a high R-factor that make it attractive as a green building product. ICF walls greatly reduce the amount of energy used to heat and cool a building. Using ICF also speeds up the construction process compared to building walls with concrete blocks. 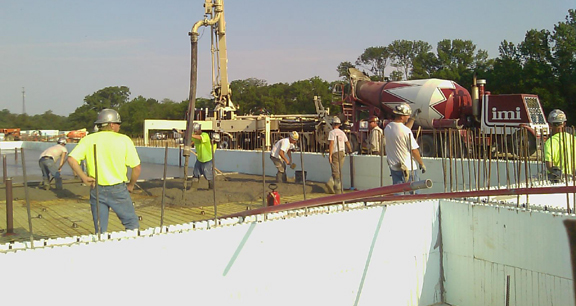 Since construction of walls happens quickly, Ferguson Construction needed a concrete supplier that could supply a large amount of concrete and keep pace with the construction of the walls. They turned to IMI. All of the concrete was mixed and delivered to the site via the IMI Oxford, Ohio plant. The mix design used in ICF walls has to be both flowable and self-consolidating so that it fills all the gaps and can be finished without vibrating it into position. In total, IMI supplied 18,265 yards of concrete for this project. Link to high school construction web site. Click here. More information on ICF walls.